There is a mountain of fun waiting for you at Bonanza Golf! We have two 18-holes Championship Miniature golf courses "Gold Nugget" and "The Prospector" set in an old western mining theme. Each course runs along the largest waterfalls in town. No matter what is your skill level, you and your family/friends will enjoy both courses. Bonanza Golf and Gifts began around the late 80's. We are known for the highest mountains holding the largest waterfalls pumping 21,000 gallons per miniute. Our business treats your family as if it is our own! We are family owned and operated and pride ourselves on the highest of customer service to our guests. One-Round of Mini Golf (18 holes) for 4 visitors. (Gold Nugget or Prospector Course). 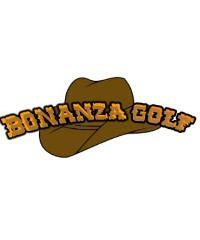 Bonanza Golf and Gifts is open 365 days a year. From 9am - 11pm. (Weather permitting). Offer can not be separated and is not valid with other offers or discounts.